Some time ago I’ve received an inquiry for repairing a couple of car radios for AMC vehicles. For our European readers, it might be beneficial to remind that AMC, American Motors Corporation, was the automobile company which owned the iconic Jeep brand across ’70s and 80s, before its sale to Chrysler. The two car radios were standard AM/FM stereo, but with a citizen band (CB) transceiver. They were sold specifically for the Jeep Grand Wagoneer, CJ-5/7/8, Scrambler and Pickup at the end of the Seventies and at the beginning of the Eighties. I was told in both cases that the car radios weren’t able to receive any FM station, only humming, whilst AM and CB bands were working fine. These radio can be identified via the part number AMC 3235647 (I also saw some nearly identical sets with part no. 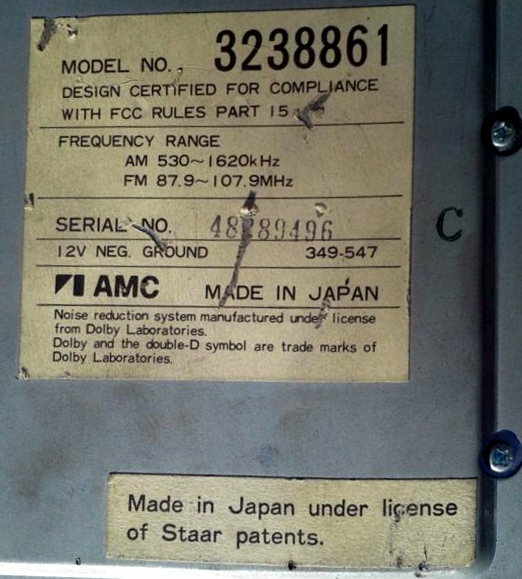 AMC 3231848 and 3235363, as well as an AM-only radio with CB, AMC 3231847, and an AM/FM radio without CB, AMC 3240714), and were made in Japan by Mitsubishi Electric Corp. Later models, such as AM/FM 7700776578 and 8956001282, were still made in Japan, and some newer ones (such as the AM/FM 8936001127 and 8956001843) in Singapore. AMC car radio of the 60s and 70s were manufactured by Motorola in US, instead. I was initially hesitant in accepting this restoration project since I couldn’t find any documentation about these models or similar Mitsubishi radios: it can be very difficult and challenging to work on these sets without service manuals or schematics. At first, I asked the owners to make sure that there was no mechanical fault: when turning the knob, the dial pointer was moving correctly across the broadcast dial. Moreover, since the radios have a CB transceiver, it might have been damaged if someone tried it without connecting an antenna or a dummy load. As soon as I received the radios, I was able to verify that they were working properly in AM indeed. AM and FM circuits are separated: the AM one is transistorized, like a common pocket radio, while the FM one is using two integrated circuits; the second IC (stereo FM decoder) seemed to be working, whereas I had serious doubts about the first, a Mitsubishi integrated circuit (IF amplifier, FM demodulator). As previously mentioned, it can be very complicated to troubleshoot this kind of devices without any service manual or schematic diagrams. Even for the Mitsubishi integrated circuit, nearly no information is available on the Internet: only a description of the pins, no data-sheet at all. Confidentiality must have been an important corporate value at Mitsubishi at that time! I could verify, injecting a signal, that the IF signal (intermediate frequency of a super-heterodyne receiver) was present as input to the IC and that it was altering when turning the tuning know (which meant that front-end and oscillator stages were working, and the radio was receiving the FM signal), but the output signal was completely flat-lined. Moreover, the output voltage was 2 volt only: for a vintage device, this voltage was clearly too low to allow the internal IF amplifier working. The fault was certainly identified in this IC. I ordered the spare parts from a British seller, and after the replacement of the faulty integrated circuits, both radios were able to properly work in FM, too. As per regular maintenance, I lubricated the potentiometers, checked the continuity of all the cables (including the cable of the microphone) and verified that all wave bands (including AM and CB) were receiving correctly. Also FM Stereo was in order, as shown by the green LED on the left: the stereo decoder works only if it receives the 19 KHz embedded in the low frequency audio signal. In this short video we can see it working. On the receiver point of view, it also worked but there were faulty contacts on the channel selector switch which had to be cleaned with a deox spray. Only few days afterwards, I was contacted for repairing another AMC car radio, part number 3238861, more or less contemporary of the previous 3235647, with a cassette player but without CB. It was also made in Japan by Mitsubishi for Jeep vehicles. Coincidence, also this radio wasn’t not working in FM. On top of this, cassette player had mechanical problems, and the pivot pin of the volume was warped. The fault was due to a faulty IC in this case, too. After its replacement, the radio was working again. After the bent pin of the volume and the cassette player were fixed, also this car radio was ready for be reinstalled in its old companion, an iconic Jeep. Regarding the 3238861 unit (w/cassette). Do you recall which IC was faulty in the FM section? I am working on one of these myself for an AMC Eagle.